Just for a change I treated myself last weekend to a Napoleonic game with some of the old mates in Cheltenham. Paul D had devised one of his clever historical interpretations at 1:100 figure scale and his well tried home grown rules. This was to be the Battle of Hanau, noted for a brave blocking action by the Bavarian army trying to stop Napoleon's Army retreating back to France from the Battle of Leipzig. I took the role of the Austrian Right Wing commander, General Baxh, so I only had sight of the Austrian briefing, but it gives a good overall view of the background. My co-generals were Chris Newcombe as General Wrede C-in-C and Austrian Centre Right, Tony Woodman commanding the central Bavarian Corps and Ken Collier commanding the Bavarian/Austrian Left wing cavalry. Mike Tovey played Marshal Macdonald, facing me, Lucas Wood had a dashing role as General Lefebvre-Desnouettes with the Imperial Guard cavalry while Pat Burden as Napoleon lurked off table at the start but dipped his hand in sharing with Mike the Imperial Guard Infantry and Artillery. Later Pat came on with Marshal Victor's Corps and Napoleon himself. Austro-Bavarain Coalition forces are strung out down the centre of the table. Mike looks on while Chris, Tony and Ken get to grips with their first batch of "Event cards"
......but within two to three moves the inevitable happened when you face French Imperial Guard Lancers, Chasseurs, Horse Grenadiers and Dragoons and Ken's cavalry and Horse artillery were dispersed. Austrian left flank now empty of Coalition troops! By about Move 4 or 5 things were changing rapidly. My three colleagues were sharing out units to give poor Ken a new command as the left part of the table was now completely dominated by French cavalry. The Bavarian Corps had been suffering from long range artillery fire and now the Horse artillery of the Guard joined the bombardment to push Tony back towards the bridges. We did not know it yet but it was all part of Napoleon's master plan to facilitate exit from our side of the table. On my flank we'd been playing it cool assuming the French would take the initiative, but Mike did not so Chris and I moved gently forward aiming to box him in and make any advance slower. I had seen the trouble over by the river and sent a messenger to von Wrede offering to bring my corps over as reserve/backup in the centre while Chris held the road line. It took two moves for the messenger to get there. However we found that brigade of French Chevaux- Leger lanciers very intimidating as we had nothing to match it and that prevented us doing anything decisive. This had been an exciting and nerve wracking episode in which I feared my own Corps would be broken open, but luckily the loss of one brigade was all we sustained and were now free of enemy cavalry so could resume our advance if we chose to. However, as can be seen below, the French cavalry attack was a very useful ploy to keep us back while Victor's Corps has been arriving along the road, where Macdonald had erected a pontoon bridge, and were now crossing the river in considerable force, leaving us guessing what would happen next. That messenger is on his way back to me with the answer from von Wrede. Unfortunately Chris' ADC die roll indicated the messenger had got lost and I never found out whether I had been given permission to retreat to a more useful position! You can see my right flank units are going that way......but it was all looking a bit academic now. The next sequence of photos shows the gradual decline of Tony's position with the Bavarians contracting to try to hold a double bridgehead under attack by Imperial Guard Foot Chasseurs and Artillery, and eventually Guard Chasseurs a Cheval. Fatigue points are caused mainly by casualties - yellow indicates "Tired"
and red means "Exhausted". Units don't usually last long once red is reached. In a wargame their fate is somewhat sanitised by "broken, remove from the table!" Back on the Austrian right as you can see in the photo below, Victor's Corps has crossed the river in strength and is now forming column to march to the left behind the fighting line and make progress towards Frankfurt. Chris and I pulled back our Austrian Corps (he in indecent haste I thought!) as we could see things were going to get worse in our left rear. But this was something of a "Hastings" ploy on my part as I wanted to draw Mike out of those woods where his relatively low quality troops might be more vulnerable to a limited counter-attack. I wrongly assumed that eventually he would want to get down the road in front of us. Now Victor's cavalry brigade comes forward, forcing my infantry into squares. During this time my Corps Commander, Baxh, had been unhorsed (by an enemy Event card!) and thought to be dead, causing all my units to test for morale. It was a bad round of dice rolling as can be seen by the number of "shaken" markers in evidence in the above photo. At bottom left corner and below you can see Chris had brought von Wrede over to help me rally, even though the troops at the bridge were still under fire from the Guard artillery. Within a couple of moves I had mostly recovered and seen off those pesky cavalry for the moment. But I still hadn't realised this was part of Mike's plan! to blow the pontoon bridge behind them! Above and below: Both sides had been manoeuvring round Hanau. Lucas contemplates his next Event card while umpire Paul uses the "Pen of Doom"
Feeling smug I consolidated the remains of my Corps into a nice solid-looking line, only to look up and see Mike with that familiar grin spreading his men out into column of march and heading off across the pontoon bridge - which is what he intended all along. The uncrossable river seemed likely to cause a standoff. We'd had about 12 moves and dusk was approaching. Victor's Corps was clearly going to make it across the field and exit towards Frankfurt so I was in favour of an honourable retreat, but my colleagues were made of sterner stuff, despite our prodigious losses, and were about to contest the main bridge in earnest. An attack by Austrian infantry across the bridge in an effort to get rid of the Guard Horse artillery. Sadly, Chris's corps commander now succumbed to that unpleasant "shot horse" Event card. column attacks beyond......all seemed lost. The French had 12 infantry (including 2 old guard - and six conscripts) against 23 coalition (inc 3 grenadier). The French had 3 skirmish bases against 6 Coalition (inc 2 jaeger). 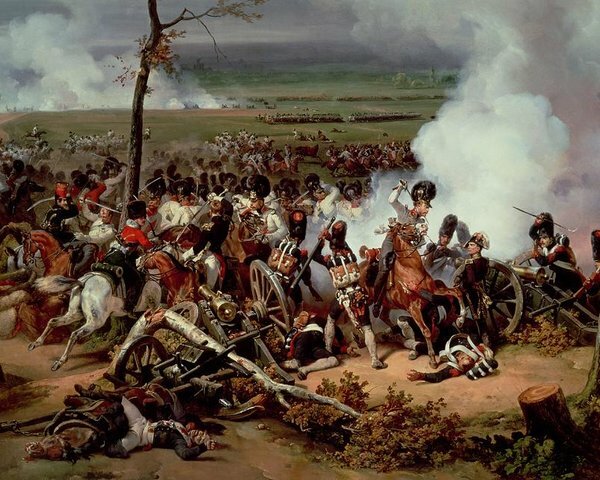 In addition, the French had 7 cavalry (inc Guard who had lost some fatigue getting through the woods to the battlefield) against 6 line and although both sides had the same number and type of artillery, the coalition was not as powerful. Ultimately, the French had to attack and score much greater damage against a defensive line and break through, without taking too many losses - which they did. It was a brilliant game. Even though the result seemed so unbalanced I have to hand it to our opponents for playing to their strengths, using the terrain well, and suckering us with their grand tactics - Just what one would hope for from Napoleon when the odds seemed stacked against him in 1813-14! Well done Paul! 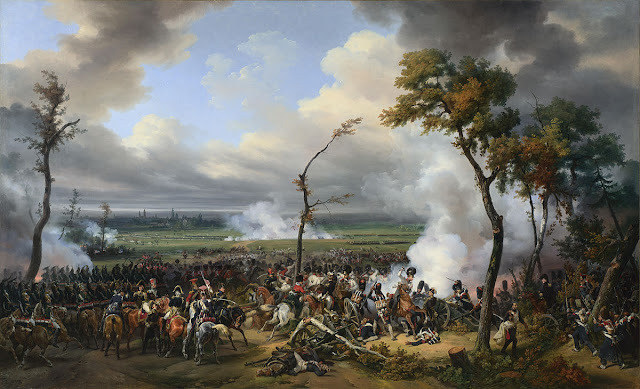 I will finish with Horace Vernet's classic painting of the Battle of Hanau which has inspired me since I was a boy wargamer over 50 years ago.............I hope some readers will be similarly moved! Truly a nearly impossible task to 'halt' the juggernaut known as the French Imperial Guard ... even in late 1813. At the Salute convention in 1998 we did an all metal 28mm mammoth game of Hanau. Won the 'tonnage' award for the convention, took all day to run the game. I had the distinction of being named the Napoleon player and deploying the foot guard and guard artillery. The team did well and the Bavarians were swatted away even faster than in your game. Terrific. How were the event cards used and what sort of stuff was on them? Colin, much appreciated. In answer to your question Paul likes to have basic rules but feature cards that, beyond them, give "flavour" often related to a particular historic battle. He prides himself on his reading of first hand accounts etc for inspiration for incidents that can be adapted to a game but within existing rule mechanisms. He gives the C in C 3 cards from the pack each turn and he decides which subordinate players to give them to or keep for himself. Players can't hold more than 3 at a time and may give back or swap to keep the limit. They decide when to play a card for maximum effect (may help their units or b***** up the enemy)as long as it is within their sphere of influence not way up the other flank. He has probably 50 or more, some duplicated and they add a layer of richness and fun to a historic game. I can put you in touch with Paul if you want examples. So sorry I missed this one as it looks absolutely terrific. Another testament to Paul's games master prowess. I did, however, witness a French defeat on a different green field on the day and their 'Waterloo' at Twickenham instead! (Didn't see Napoleon though!) Thanks for putting this on the blog Chris - much appreciated. Hanau is an interesting battle Chris. I fought it many years ago funnily enough it was the last outing for my Hinchliffe and Mini Fig Napoleonic armies. Napoleon was very scathing of the Bavarian deployment and when the Grade artillery got cracking the Bavarians didnt hang around too long. It looked a great game and I like the idea of using event cards just to make things even more interesting. Hello Robbie, good to have your comments thank you. That experience of the Guard artillery sounds very similar to our game then. Paul experimented for many years with the Event cards, we found if there were too many they dominated the game and detracted from the skill element we all enjoy in wargames. So this level of cards gives enough choice (I only played two in the whole game,others maybe 5 or 6) so you play them when it really matters but without skewing the overall result too much. For example when my Grenadiers attacked I got up close and used a card that gave me Plus 1 to all firing dice for exceptional volley fire that turn. It sent the French brigade packing for two moves but did not destroy them outright. This is a great report, can clearly understand how the action is unfolding with the captioned pictures and narrative - many thanks! One I'll also have to try at some point. Thanks Mark.........if a stories worth telling.........As a player I would judge this a difficult battle to get the balance right, so good luck with your own scenario.